CLICK HERE for more Funeral Flowers. 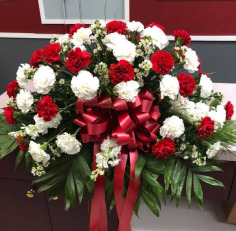 A funeral for a friend or loved one can be difficult, but funeral flowers from EAST MEADOW FLORIST of EAST MEADOW, NY (NY) can help begin the healing process. Funeral flowers provide the opportunity to express how much the departed means to you. Celebrate the life of your loved one with one of the beautiful funeral flower arrangements found here such as: Classic Remembrance Urn, Mixed Flowers Sympathy Tribute or one of our Standing Sprays. Browse our funeral flowers page to find the perfect sympathy arrangement and place your order online. 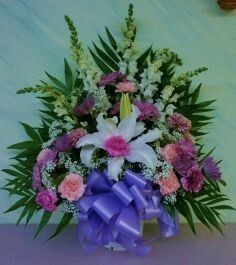 You can also call and speak with a designer at EAST MEADOW FLORIST in EAST MEADOW, NY (NY) for funeral flowers just as unique as your friend or loved one. Pay your last respects to a departed friend or loved one's family with an uplifting floral standing spray. The natural beauty of each flower offers comfort to all in attendance. 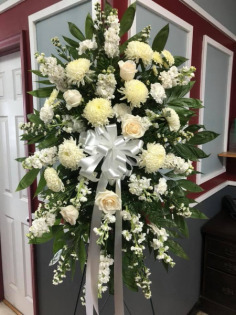 Let EAST MEADOW FLORIST help you choose the right standing funeral spray for your final tribute. If you would like something more personalized, give us a call or stop by our location in East Meadow. Casket sprays offer a final tribute to a departed loved one. It's beauty and elegance sets the tone of the funeral service. There are two types of casket arrangements: full couch and half couch. Full couch is for a closed casket, and half couch arrangements are typically used for an open casket. Flowers for cremation services are also available. 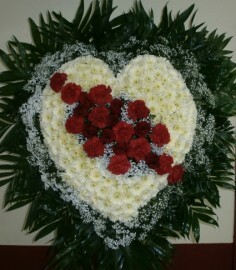 For any type of funeral flowers in the East Meadow area, EAST MEADOW FLORIST is here to help. Sending flowers to a funeral is a time honored tradition that extends through generations. Sympathy flowers often express feelings that we may not be able to. EAST MEADOW FLORIST can help you find the right message to convey through flowers. Shop our selection online or give us a call at (800) 452-5515 if you need more assistance. Flowers serve as an inspiration and a tribute to friends and loved ones during trying times. Cremation urn and memorial flowers can act as a personal expression of love or as a warm send-off. When you work with EAST MEADOW FLORIST, we endeavor to illustrate the essence and memory of your loved ones with a beautiful floral expression of their lives. Our selection of floral inspiration covers a wide variety of personalities and tastes. Looking for something different, or want to add a personal touch? We also do custom arrangements. Call for pricing.